Welcome to the March newsletter, read on for some really good news, details of the new site level stats ZAP now supports and an introduction to scripting. This is the second time we've come top and is a great validation of what we are doing. Thank you to all of you who voted for us! Other important news is that ZAP is taking part in the Google Summer of Code (GSoC) 2016. For those of you who don't know, GSoC pays students to work on open source projects over the summer, and we've had key ZAP features like WebSockets, the Ajax Spider and Access Control testing implement by GSoC students. The deadline for submissions has just passed and we've had 9 ZAP proposals. We'll evaluate those asap, but we dont currently know how many slots OWASP (and ZAP) will actually get so fingers crossed! A new version of the Zest add-on has been published which included a significant number of bug fixes. There is also an update to the Selenium add-on which includes the latest Selenium release that ensures Firefox doesn't visit the 'first run' page every time it is started. The Alert Filters add-on has also been updated with various bug fixes and has been promoted to beta status. This add-on allows you to configure rules which automatically change the level at which alerts are raised for specific contexts. For more details see the help pages This add-on is included with the weekly releases and may well be included by default in future full releases. This section details enhancements that have been made to the core and are available in the latest weekly release. The traditional spider has been updated so that you can constrain it to a subtree when using it via the UI or API. For example this means that with this option if you start spidering from https://www.example.com/app1 you can be sure that it wont explore any other apps under https://www.example.com/ - without this option it will explore anything in that domain it finds links to. The stats are currently only available via the API, but they can be really helpful, for example if you are trying to work out how effectively ZAP has scanned a large site. There is an almost infinite range of web applications and so its not possible for any tool to build in support for all of the strange things you will encounter. As ZAP is an open source project you can change the source code to handle anything you like. However this isnt always practical - ZAP is a large and complex project and even if you understand the code base very well, firing up an IDE to rewrite ZAP every time you encounter something strange is definitely not ideal. Fortunately ZAP has powerful scripting capabilities, and ZAP scripts can access all of the code and data structures. There are so many aspect to ZAP scripting that one tutorial wont be enough, so we're going to start with an overview. Scripting support is included in all ZAP releases, but if you want to use scripting in the 'core' version then you will really need to download the Script Console and Zest add-ons from the marketplace. By default ZAP supports ECMAScript (JavaScipt) and Zest, a graphical security scripting language from the Mozilla Security team. You can also download add-ons which extend support to Jython and JRuby. ZAP will be able to support any language that supports JSR 223 so if there's another scripting language you would like us to support then please raise an enhancement request issue. To use ZAP scripts from the UI you need to use the Scripts and Script Console tabs, which are hidden by default and can be accessed via the relevant tabs with the green plus sign. The Scripts tab shows all of the scripts available in a tree view. Active Rules - these run as part of the Active Scanner and can be individually enabled. Authentication - scripts that are invoked when authentication is performed for a Context. To be used, they need to be selected when configuring the Script-Based Authentication Method for a Context. Fuzzer HTTP Processor - these can access and change the fuzzing HTTP requests and responses, control the fuzzing process and interact with the ZAP UI. 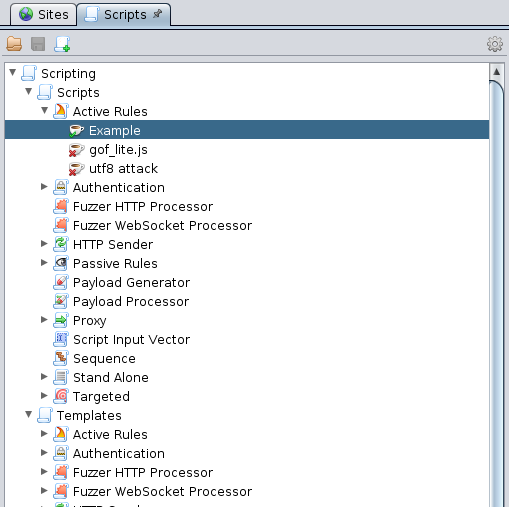 Fuzzer WebSocket Processor - these can access and change the fuzzing WebSocket messages, control the fuzzing process and interact with the ZAP UI. Http Sender - these run 'inline' and are similar to Proxy scripts except that they also apply to all requests that originate from ZAP. Payload Generator - these generate the raw attacks that the fuzzer submits to the target application. Payload Processor - these can be used to change specific fuzzer payloads before they are submitted. Proxy - these run 'inline', can change every request and response proxied through ZAP and can be individually enabled. They can also trigger break points. At the top of the Scripts tab is a toolbar with buttons that allow you to Load, Save and create New scripts. When you use the 'New Script…' button you will be prompted to select one of the available templates. You can also create scripts by right clicking on the template you want to use. Some templates are blank but many of them perform useful functions, and all of them include lots of documentation to help you customize them. When you select a script in the Scripts tree then it is displayed in the Script Console. For most scripting languages this is where you will edit it, the only exception to this is Zest which is displayed graphically in the Scripts tab. 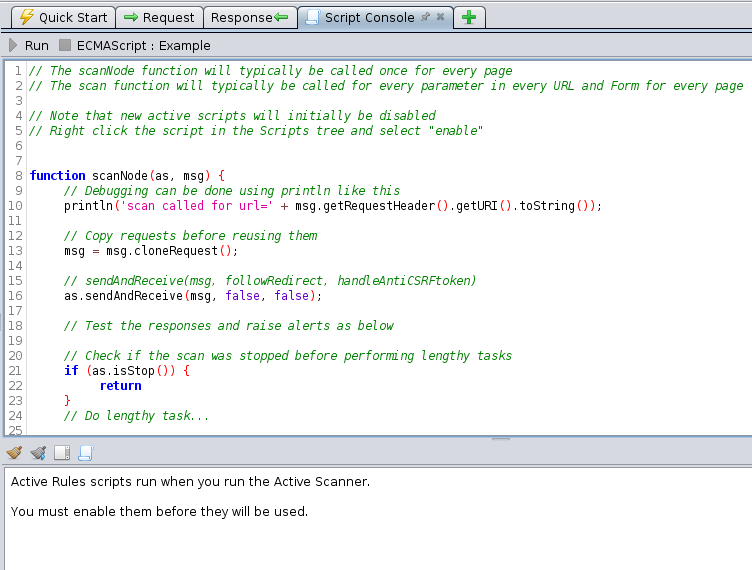 At the top of this tab is a toolbar that allows you to Run the script displayed and Stop it if it is running. Note that not all scripts can be run in this way - some types can only be run via other ZAP components. For example Active Rules can typically only be run when you start an Active Scan. Underneath the panel displaying the script is another panel which shows the script output. The Scripts Options panel allows you to add any number of directories that contain scripts. The scripts must be in subdirectories named after the relevant script type and must have an appropriate extension for the script language used. Scripts that can be written to will be added to the Scripts tree and those that are read only will be added to the Templates. This means you can build up your own libraries of scripts and even manage them in a central place using a shared drive. If you would like to write content for the newsletter then please get in touch - anything ZAP related, such as talks / training you are giving, a 3rd party tool you develop or maybe an add-on you'd like to explain in more detail. And we're also looking for one or more editors for the ZAP newsletter - you don't need any detailed ZAP knowledge, just a bit of time each month you can dedicate to chasing up people for content and bashing it into something that reads better than this one :P Think thats you? Get in touch!